I do not understand the Bowsette thing, honestly. This is specially confusing because -I- love her too...what witchcraft is this?! Giving a small boost to Who's doing comissions. Dude's great, has a good mix of old school manga and some western influence. And he also does muscle gals so, for you muscle lovers, there ya go! Comissions are open for any and all to see. Muscle, non-muscle, lewd and SFW. Check my page for the comission info and send me a note if you've any doubts. I'm in a bit of a crossroads about Nem right now. So, her design was always to combine a ver very femenine face with the massive body, however I decided to make her nose big. now I'm wondering if I should make her nose cute and small. I don't want to rob her of her identity but I also want to stick to the contrast between face and body. Anyways, despite how everything is going, someone tagged me, so I may as well have a little bit of fun. has tagged me in this fact challenge, so I thought I'd do it just for some levity. 1. Post all the rules of the challenge. 2. Choose one of your characters, and post eight facts about them. 3. Tag eight other people, along with one character from each person tagged. 1. Nem was bred in a tube in a planet very, very far away. She's got no real parents, just genetical schematics. 2. Nem's very old, over three thousand years old in fact. 3. 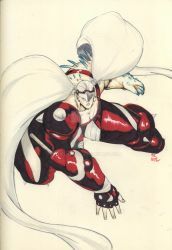 Nemesis has incredibly light skin, despite coming from a planet iwth a very powerful sun. This causes her skin to very clearly show when she blushes, it's impossible for her to hide a blush. 4. Nem took a big liking to profesional wrestling. She considers it an interesting mix between gladitorial combat and theatre. 5. Nem can be quite promiscuous, as she was allowed sexual slaves in her home planet. Though she never liked forcing anyone, so she'd let them choose when and where. 6. Nem was a very high ranking officer in her home planet. One of the six commanding generals of her army. 7. Nem has no idea how her planet was succesfully destroyed. She knows it was done by some sort of enormous machine, only known as "The God Machine" But who brought it there is a mystery. 8. Nemesis decided to have a peaceful life on Earth, and for the most part has no desire to fight. Unlike others such as Sovie She only gets involved if the situation is absolutely dire and entire cities are at stake. But she won't go patrolling, she isn't fond of fighting anymore. Not unless it's a spar. So, I guess I get to tag now. Aaaand I'm kind of out, I'll cheat on that. I do hope they come.